Hardcover. Very Good. Former library copy, has library associated stamps/stickers. Different cover art than shown, same exact book. Very good used condition, little to no signs of wear, little to no signs of use. Ships fast & secure, expedited available! Harcourt, Brace & Company. Hardcover. . Good. Methuen., 1954. pp.xiv, 183 with b/w. photography, illus. and text figs. 8vo. A thor. vg. hdbk. in thor. vg. dw. London: Methuen, 1954. 1st Edition 1st Printing. Hardcover. Very Good/Very Good. London: The Country Book Club. Hardcover. pp xlv, 183. Prior owner details to FEP. Spine sun browned, otherwise fine. . Fine. 1955. 1st Edition. London: Methuen/Readers Union, 1955. No marks or inscriptions. A very clean very tight copy with bright unmarked boards, minor bumping to spine ends and no bumping to corners. Dusty dust jacket not price clipped or marked or torn with sunned spine, very minor foxing and rubbing/nicks to upper edge. 183pp. 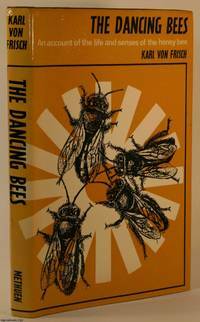 An account of the life and senses of the honey bee. Illustrated with 61 figures in the text and thirty multiple plates. Translated from the German by Dora Ilse.. Hard Cover. Near Fine/Very Good (-). 8.25 x 5.25 inches. Methuen - University Paperbacks. Used - Very Good. Ships from the UK. Former Library book. Great condition for a used book! Minimal wear. 100% Money Back Guarantee. Your purchase also supports literacy charities. Methuen & Co. Ltd., 1954. Book Hardcover. Good/Good. Boards slightly cocked. Foxing to edges of pages. DW worn at edges and soiled, chipped at edges of spine. DW spine sunned. Internally clean. Binding narrowly visible between some sections. Readers Union - Methuen. Used - Good. Ships from the UK. Shows some signs of wear, and may have some markings on the inside. 100% Money Back Guarantee. Your purchase also supports literacy charities. Methuen & Co, London, 1966. Second Edition. Hardcover. Fair Condition/Good. 14 pages, 198 pages with some illustrations. Bound in original brown cloth, with gilt lettering to spine. AYR county library book plate to inside of the front board. Library stamp to front endpaper. All edges are slightly marked. Back of dust jacket a little sunned. Size: Octavo. Quantity Available: 1. Category: Science; Inventory No: 289051..
Good-Plus condition. Tight copy, unmarked text; minor other handling wear.